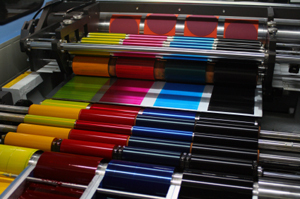 Breakaway Press provides a full-spectrum of printing and graphic arts needs, such as but not limited to: offset, digital, web, letterpress, long and short run printing, prepress, creative art, bindery, fulfillment and mailing. Some of our products include: business cards, letterhead, flyers, brochures, catalogs, forms, self-mailers, sell sheets, DVD/Bluray wraps, stationery, envelopes, invitations, holiday cards, posters, banners, cartons and custom packaging, labels, binders, pocket folders, promotional material and… look, if there is paper involved, we do it. But not just paper, we also offer CD replication, vinyl banners, banner-stands, we print on plastic, socks and other clothing, banana leaves and… look, if there is some kind of ink involved, we do it. But wait, not just ink either, we also offer translation services, design your brand and artwork, manage, archive and organize your digital files, manage inventory and warehousing, fulfill and ship to every state and beyond, plan and execute custom mailing projects and… look, if you just need a message communicated, in any form, call us. We are in the business of helping you spread your message.